It’s one thing to know all these leadership principles but what really matters is what you do – how you APPLY these APPS. These APPS can wake you up, show you where to shop, help you count calories, log your exercise, and keep your to-do list … but they can’t make you get up or control your spending or manage your diet or make you exercise or check off your to-do list … application makes all the difference … application is everything! Α&Ω – Jesus is our “Provider”; you’re following His example of Servant Leadership. Network Connection – You’re connect to the “Cloud” (Holy Spirit). Clock – A reminder that time is passing, leadership is a stewardship & you’re accountable! Battery % – How you say you’re doing when others ask. Battery Icon – How you’re doing, really. Do you need to recharge from use or are you sitting idly by? Apps – Essential leadership qualities, characteristics and skills we all need to be servant leaders. Some are expensive apps and others are the $0.99 apps. Multitasking – Most of the time you’re using multiple apps at one time. Must learn this art! Orientation Lock – This is about adaptability; different environments require different apps. Dock Apps – Apps you can’t delete if you want to serve the Lord and His people. 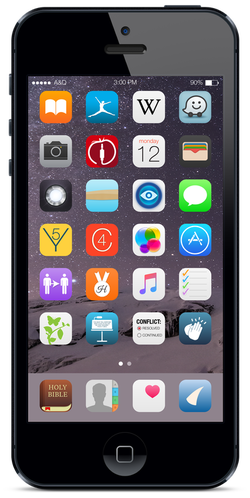 Home Screen Apps – These are essential for every servant leader. Secondary Screen Apps – Necessary; not as critical or less frequently used. Smart Phone/Technology – in our day and age, it’s a must!